USEFUL INFORMATION ON HOW TO DO DIFFERENT THINGS IN ENGLISH. There are basically two types of speaking: spoken production (simply producing words) and spoken interaction (speaking/conversing with other people). Both are important, but this month we’re looking at spoken production. Great news! The latest issue of Hot English (192) is out now! Learn over 1,000 useful words and expressions and improve your listening skills with Learn Hot English! 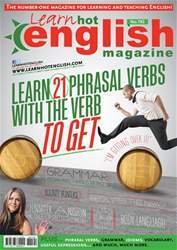 This month: Learn 21 phrasal verbs with the verb “to get”. Plus, 12 useful words and expressions for talking about the body, 10 expressions for describing body language, 6 useful expressions for talking about the phone, idioms, phrasal verbs... plus: • Psychology – liars. • Culture – pets. • Speaking – how to speak English. • Grammar – the present perfect & past simple. • Travel – Denver, Colorado. • TV – late night shows. • Actors – Jamie Foxx & Jennifer Aniston. • The USA – bounty hunters. • History – mutiny on the Bounty. • Transport – road rage. • Food – tuna pasta. • The past – the Spanish Armada. • Accents – the Black Country accent. • Health – unusual exercise routines. • Language – irony. AND LOTS, LOTS MORE! By reading and listening to all this great content, you'll improve your English reading and listening skills and learn up to 1,000 useful words or expressions. Plus, you'll get a better job and pass English-language exams more easily. Guaranteed!